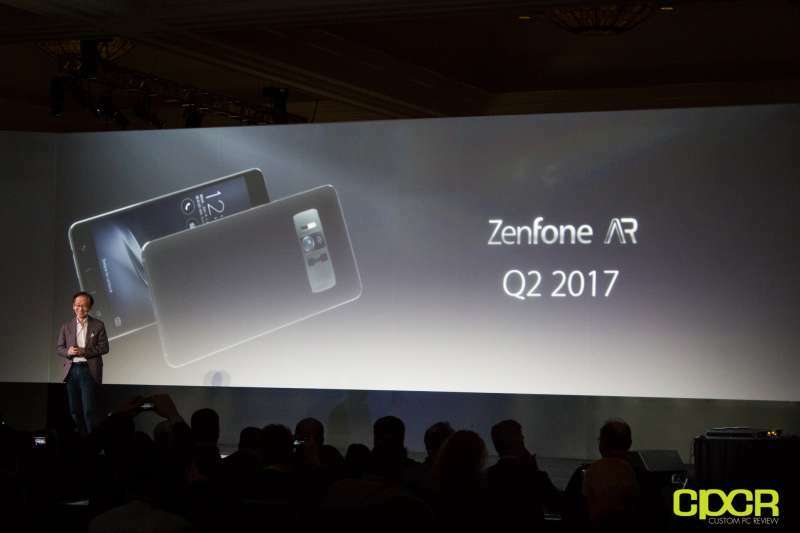 At its press event at CES 2017, ASUS was excited to announce two brand new smartphones, the ZenFone AR and ZenFone Zoom. 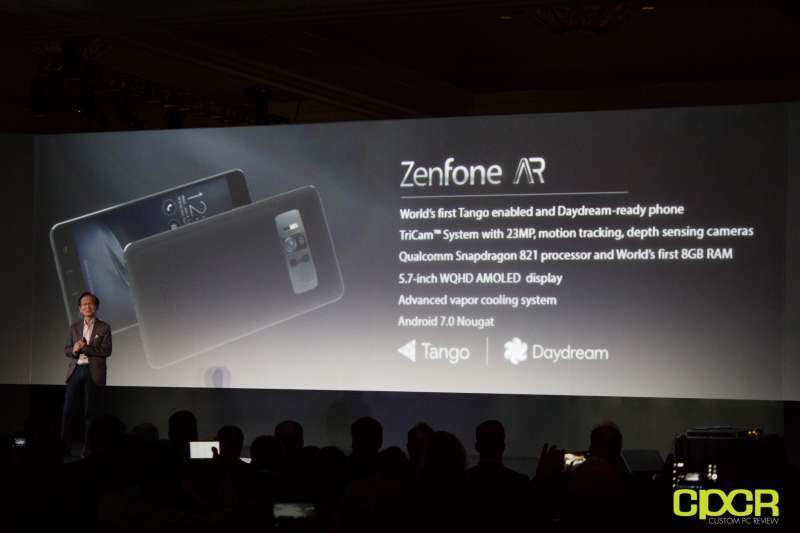 The first smartphone is the ZenFone AR. AR, or augmented reality, combines scenes in the real world with virtual objects on the screen. The AR magic on the ASUS ZenFone AR is delivered using three rear cameras – a motion tracking camera, a depth-sensing camera, and a 23MP image camera. The information from the three sensors are compiled together to form a comprehensive, interactive 3D image on brilliant 5.7-inch super AMOLED display. To ensure the AR experience is as smooth as possible, ASUS uses the Qualcomm Snapdragon 821 SoC. AR compatibility is entirely enabled by the SoC requiring no external processors to install. Other than its AR capabilities, ASUS has an impressive spec sheet for the ZenFone AR. This includes 8GB of RAM, a 5.7″ 2560x1440p Super AMOLED covered with Corning Gorilla Glass 4, a f/1.7 aperture main rear camera, and a five magnet speaker. Currently, the ZenFone AR is at the forefront of a handful of VR phones. It joins the ranks of Lenovo Phab 2 to bring pioneering AR technology to the consumers. The ZenFone AR will be available starting Q4 2017. No pricing information has been announced for the new device. For VR fans, the ZenFone AR is also fully compatible with the Google DayDream VR headset. The second smartphone revealed at the ASUS press conference came in the form of an update to the ASUS ZenFone 3. The new ZenFone 3 Zoom aims to bring unprecedented image capturing capabilities to smartphones. As its name implies, the ZenFone 3 focuses heavily in improving the photo capturing capabilities of the camera. The camera is now driven by the new Sony IMX 362 sensor, now updated from the Sony IMX298. Aperture has been widened from f/2.o to f/1.7. Not only will this help with macro photography by improving the depth of field, it should also help with low light photography. 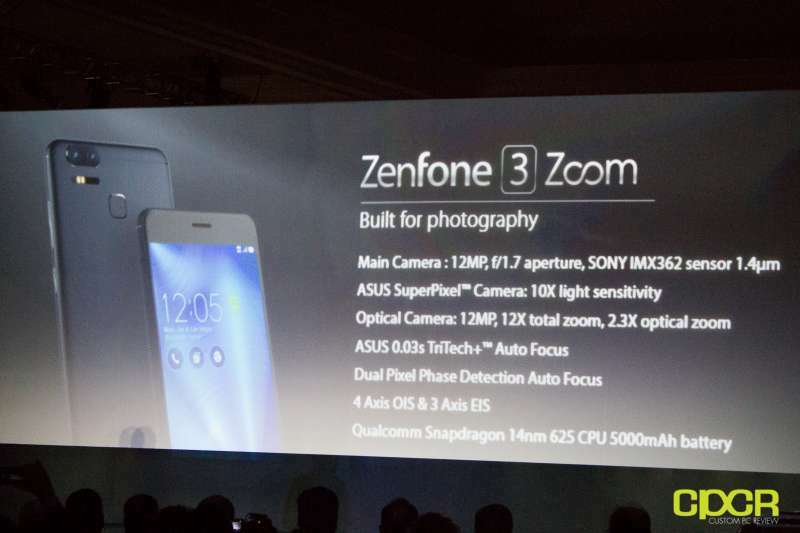 In addition, megapixel count dropped from 16MP on the ZenFone to 12MP however, pixel size has been increased to 1.4μm. The front camera has been reworked as well. It now features a f/2.0 aperture and a resolution of 13MP using the Sony IMX214 sensor. ASUS claims that combined with its SuperPixel technology, the front camera is as twice as sensitive to light as the previous generation. Of course, sensors and lens are just half the picture. The ZenFone 3 Zoom also comes equipped with ASUS’ 2nd Generation laser and phase detection autofocus, Super Pixel scaling technology, and subject tracking autofocus. A host of professional settings such as white balance, shutter speed, ISO, and manual lens selection are also unlocked for the pros. The other significant change is the battery capacity. The battery size has been drastically increased, jumping from the 3,000mAh on the ZenFone 3 to a whopping 5,000mAh battery on the ZenFone 3 Zoom. That’s a 66% size increase. ASUS claims that the phone can perform 6.4 hours of 4K video recording or 8.5 hours of live stream. The ASUS ZenFone 3 Zoom will be available starting February 2017.